Sir Charles is firmly on the record: "I am not a role model...parents should be role models"
The rightness of the latter point doesn't overrule the wrongness of the premise. Of course parents should ideally be the first, most direct and most influential role models in a child's life, but for anyone whose occupation requires an audience of tens of thousands in an arena, and millions in their homes to recuse himself from responsibility is laughable. If Charles wanted to take a stand and a step toward dis-emulation, he could have asked to pull the replica Barkley jerseys from all of the stores. There were plenty of little #34 Sixers or Suns jerseys on the courts in those days. It wasn't the first, and it wasn’t the last time Charles was wrong. To a child, everyone is a role model. Every encounter, every observation, every bit of media a child consumes, can have an influence as they learn how this world works. No interaction, no action or inaction is so small that it can escape a child's thirst to learn what a thing is and how it should be done. More than taking a village, it takes a society. You don’t opt in, you can’t opt out. If you exist, you are a living example. Whether you embrace that role or not, it's yours. Gatorade's marketing machine didn't create the drive to Be Like Mike any more than Nike's Air Jordans did. Their accomplishment was to masterfully brand and commodify the most natural of instincts: imitation. They made it hummable, they made it cool, and they made sure that it was everywhere that you looked. By 1997 Michael Jordan the man had officially become his own sub-brand of Nike. In 1932 when Babe Ruth pointed to centerfield to call his shot off of Charlie Root (or didn’t, depending on who you believe) it may have taken days or even weeks for the newspaper accounts to trickle down and be repeated in sandlots from coast to coast--but we live in the era of SportsCenter. Every home run admired, every bat flipped, every sack dance, every plume of chalk dust tossed high above the scorer's table, every Sharpie from every sockapplied to pigskin will be reenacted in most every schoolyard the following day. The through-line from Ozzie's backflip to Jeter's backhand flip, from a Gatorade dunk to a Blake Griffin dunk is our wanting to do as our heroes do. I have seen a ten year old prepare for each pitch by tugging the sleeve of her outstretched arm like Ichiro. 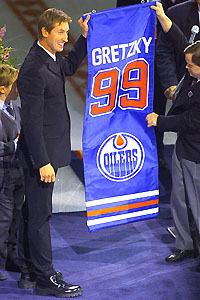 There have been thousands of little hockey players who have only considered their pre-game preparations complete once they had tucked their sweater like Gretzky. A decade’s worth of on the field or on the court style can be influenced by a single player. Just ask Allen Iverson. When it came to choosing a uniform number, there was a time when every basketball and hockey team had youngsters arguing for the honor of wearing #23 or #99. I grew up loving # 44 for Reggie before I eventually shifted to hockey and made a commitment to both a number and a hockey hero by pulling on the #11 jersey as an aspiration and in tribute to Mark Messier (then still in Edmonton). Wood, wiffle or aluminum; little as I was, I swung the bat with the same reckless abandon as my favorite Yankee Dave Winfield. When hockey took over my life, my intentionally wrong-footed wristshot from the wing mimicked Mark Messier. The celebration of an early evening goal scored, playing against the chain-link fence in the lengthening shadow of P.S. 207 could be part Brian Propp part Mike Foligno (and now his son Nick’s) leap. Those fortunate enough, as I was, learned to throw a ball the way Dad taught us. I was blessed to have that. The times when he would return from work and we could stand at either end of the narrow alleyway between our house and our neighbor’s remain priceless memories. Him heaving the ball straight up into the sky and my yelling “Pop Up! I got it! I got it!." During those sessions, his praise for my effort, for not giving up on a ball, for being willing to dive headlong to make a play taught me lessons every day. By seeing what he valued in a player, I learned what he valued in a man. It didn't matter if other boys ran faster...just as long as I ran harder. All-out effort, all the time. You knew kids like me: small body, huge heart. 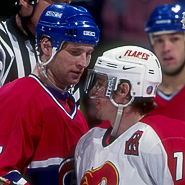 Like Theo Fleury, I learned that heart was the ultimate equalizer. Under Dad’s tutelage, I was a daily casual baseball player as boy but by the age of thirteen I had officially become a hockey obsessive. If I had chosen baseball, I could have continued to be tutored by my father. Perhaps even coached by him--as both of my brothers had been in Little League. I chose hockey; foreign not just in it's origins, but also to my family. Part of finding my own path was choosing not to do what my big brothers had done. It wasn't until I was 14 years old that I felt the pull to be part of a real, honest-to-goodness organized team. I chose hockey, and so my unquenchable thirst to learn the game and my quest for daily improvement fell to someone outside of the family circle. That is no more my parents fault than choosing hockey was mine. Keep that in mind as you peruse this site. We approach sports in a most permeable state, at a most malleable time. We pour our energies, youthful exuberance & instincts into a mold that we admire as we learn the capabilities and the limitations of our growing bodies. We want to be like Dad or Mom. Like our big brother or sister. Part of us, powerfully, wants to be like Mike. I was drawn to sports by watching my heroes on television. That allure was strengthened by the chance to display and develop the characteristics that I knew my father valued. We send our children to play sports to learn these lessons and more. The value of teamwork , of discipline, of responsibility and of loyalty. To see the reward of one’s efforts and tireless effort as a reward in itself. To strengthen the foundational lessons that that they have learned at home. I’d really like to hear from anyone out there...players and parents alike. Players: What initially drew you to play sports? Who were your sports heroes growing up? Was there a player you modeled your game on? Parents: When you sign your child up for their first team, what benefits are you hoping they will find there? For fitness and for the pure love of the game? Following in your footsteps? All of the above?